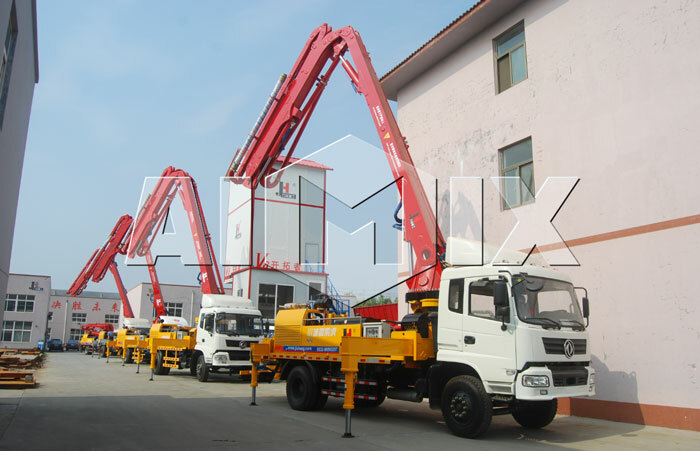 Concrete boom pump for sale also called concrete pump truck is an specific equipment, which is much more suitable for projects that require concrete in a higher attitude. It is a top choice concrete equipment, widely used in tunnel, airport, seaport, high-speed rail site, beam field, bridge construction projects and so on. 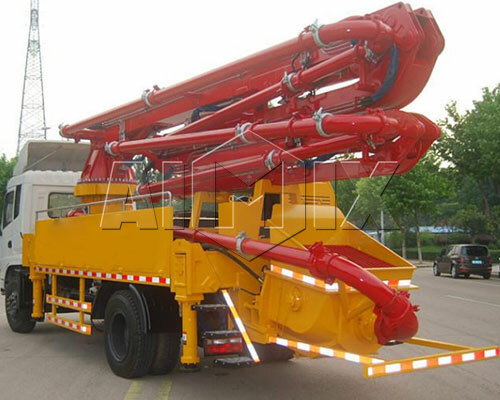 Concrete boom pump for sale is composed of chassis, concrete pump system, boom system, hydraulic system and electric system. It is worth of mentioning that the chassis engine provides power for the working and driving of the overhead concrete pump boom for sale. 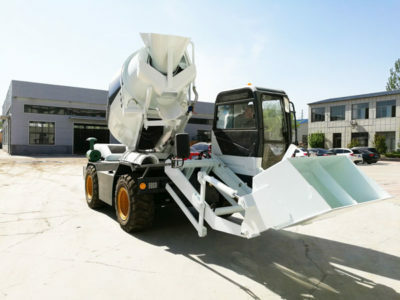 Therefore, the performance of the chassis engine directly influences the performance of concrete boom truck for sale. 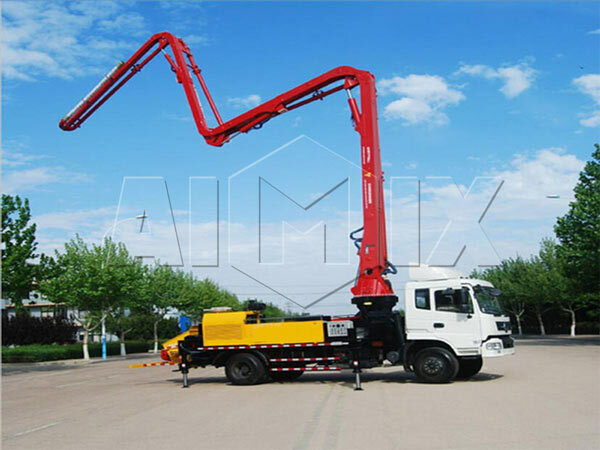 The concrete boom pump from Aimix Group can be comparable with the famous foreign brand products in many aspects, such as concrete boom pump price，pumping pressure, pumping displacement, working performance and stability. Our boom pump for sale has been sent to many countries. 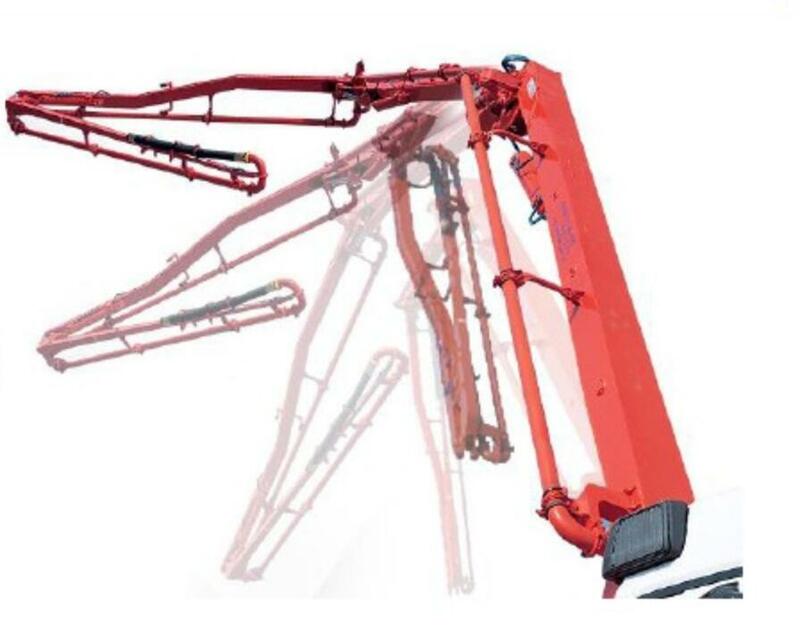 According to the height of boom, it can be divided into short boom frame (14-29m), long boom frame (32-48m) and ultra-long arm frame (52-63m). According to the number of arm frame, there are 2, 3, 4 and 5 arms. According to the theoretical throughput, it is divided into small capacity of concrete boom pump (45-88m3/h), medium capacity (91-131m3/h) and large capacity (151-205m3/h). 1.Concrete boom pumps are combined with high reliability, economy, safety and durability. 2.It has reasonable collocations for the chassis system, power system, control system, hydraulic system and pumping system. 3.Chassis adopts SINO TRUCK/DONGFENG/FAW/SCHCMAN brands, strong carrying capacity, good dynamic performance and low fuel consumption. 4.Emission system is up to international standard, low-noise and easy to repair. 5.It has the characteristic of flexible foldable arms, little space occupying support legs, easily movable chassis. 6.Equipped wit pressure switch, high outlet pressure so that the whole concrete pump truck can meet the needs of long distance delivery. 1. It is easy to enter into work site, and could quickly concentrate on work. 2. It has high working rate, fast pumping speed and is very convenient to place concrete. 3. It is of control automation, easy to operate that just need one worker can operate also equipped with remote control. 1.) It has requirement big place to occupy. 2.) 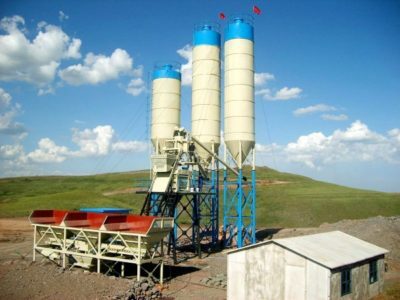 It has high demand of good quality concrete. 3.) The highest concrete pumping attitude is limited by the length of placing boom. There are two main constituents of boom system, which are placing boom and turret. And the function of this system is to complete transportation and placing of concrete. At the same time, playing an important role of supporting the whole boom pump truck so that ensure the stability of the concrete boom pump. 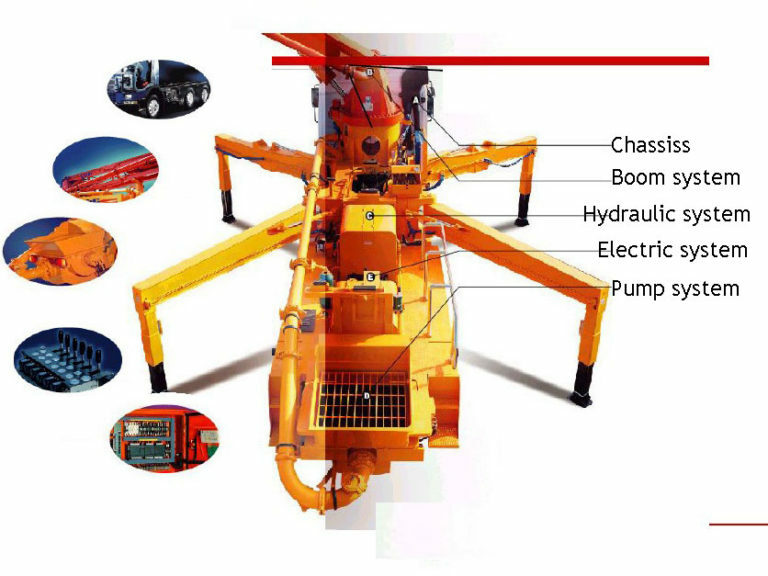 The placing boom consists of boom, hydraulic cylinder, conveying pipe and connections. Turret is composed of rotary table, rotary mechanism, fixed tower, supporting legs. 1.It is optimized design with reasonable structure. Service life is longer. 2. It adopts imported high strength 900Mpa steel plate in manufacturing. 3.It has large carrying capacity, suitable for international conditions. 4.It has small work swing when working. 5.It adopts special welding and heat treatment process. 6.It uses imported rotary bearing with strong anti-dumping ability. 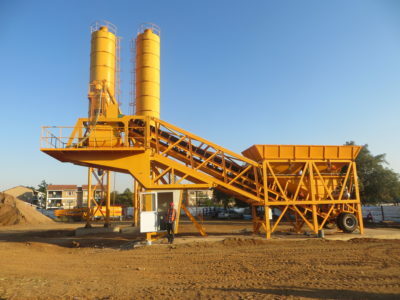 7.It has flexible operation and wide range of placing concrete. 1. Do not connect the pipe after the end hose of trailer mounted boom concrete pump. 2. The arm bracket shall not be used for lifting heavy objects. 3. 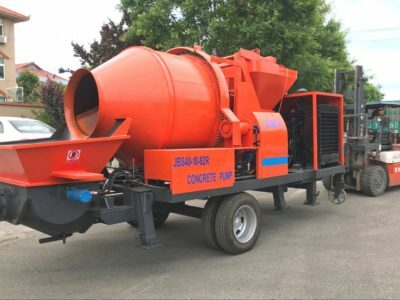 It is prohibited to make any modifications to the trailer concrete pump with boom that may affect safety, such as changing the pressure and operating speed setting, switching to large-diameter delivery pipe and changing the control procedures. 4. Operators must wear safety helmets and comply with safety regulations. 5. Only the arms and legs are fully closed before moving the pump truck. 2. The boom can no longer be used in weather with winds greater than 8 degree. 5. Be careful of the risk of electric shock when operating truck mounted boom pump near a high-voltage line. All in all, do you learn something from above introduction, we aimix group as one of largest concrete boom pump manufacturers in China, we keep improving in skill of manufacturing boom pumps, and stand on the customers, perspective, let our customers be satisfied with our good quality product, reasonable boom pressure concrete pump price and superior service. You will never be disappointed if you choose us. 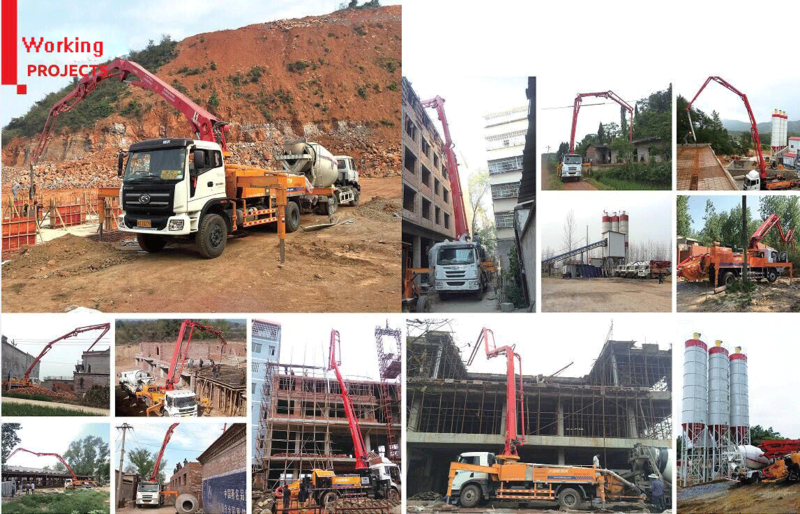 Besides concrete boom pump, we also supply other construction equipment, such as concrete mixer truck, self loading concrete mixer, concrete batching plant, concrete mixer pump, trailer concrete pump, small concrete pump, mobile concrete pump, etc. If you have demand of those machine, what are you waiting for? Just contact us quickly.